We used this for the children's hand towels, which fit them perfect. How do you change the towels out? what are the dimensions of this product ? The dimensions of this dispenser are; W 13.5cm x H 22.5cm x D 12cm. The following toilet tissue products will fit in this dispenser: 25288 & 36362. Suitable for use in high-traffic and communal bathrooms and WCs, our Bulk Pack Tissue Dispenser in Brilliant White is a sturdy and durable wall mounted container that allows each used to easily remove a single piece of tissue at a time. Made from a lightweight plastic so as not to put additional pressure on the walls, the dispenser has a self-locking cover that can only be accessed using the universal key provided. This protects against inquisitive hands and ensures only the correct sized tissue paper can be installed. The blue display window shows clearly when a top up is required while also alerting the user to the availability of towels at any one given moment. An efficient tool for preventing unused tissue becoming damp and obsolete, choose our bulk tissue dispenser for your nursery with our Children's Hand Towels. 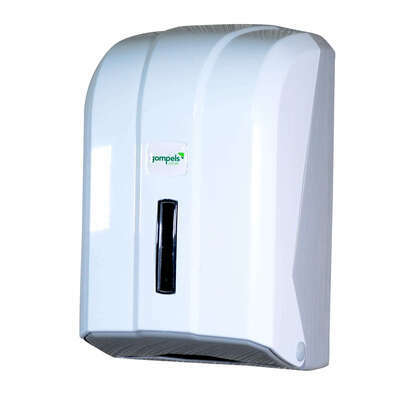 If your requirements differ to those solved by our Bulk Tissue Dispenser, we have a wide range of different Dispenser available to browse here today. We also stock replacement keys available here to ensure you'll always be able to access your dispenser. And while you're here, make sure to stock up on the appropriate sized Tissue for your requirements, all available at affordable wholesale prices.